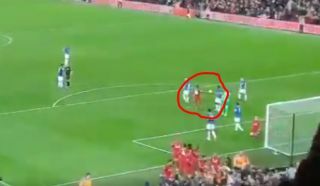 Some fan footage has captured a brilliant moment that some Liverpool and Everton fans may have missed from the end of the Merseyside Derby. Just seconds after Divock Origi bundled in a dramatic stoppage time winner against the Toffees, Sadio Mane trolled his opponent Idrissa Gueye by offering him the ball. According to the caption for this video below, this is Mane making reference to the fact that Gueye had been time wasting just moments before Origi’s goal settled the game.